Cara from Health, Home, and Happiness is offering two of our readers a giveaway of her eBook Grain Free Meal Plans, Freezer Cooking Guide. As a real foodie, I am no stranger to logging long hours in the kitchen. I often joke that I spend more time cooking than parenting my daughter. While this is not entirely true, some days it seems like I really do spend the bulk of my waking hours preparing food. This is especially true on batch cooking days. Batch cooking and freezer cooking have spared my sanity. I am on the GAPS diet to heal some health issues and trust me when I tell you that this involves copious amounts of food preparation. Without the ability to cook and freeze meals, I really would lose my mind. I have been a longtime fan of Cara, from Health, Home, & Happiness. 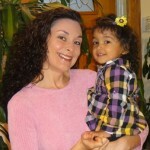 Without her other eBooks and Meal Plans, I doubt I would have made it as far on the GAPS diet as I have. All of her recipes are delicious, they are easy to make, and the meal plans take one step out of, well, planning. In the past, I have tried to take a lot of Cara’s menus and turn them into freezer/batch cooking friendly recipes. While I have had some success with this, life gets in the way of full implementation. And then, Cara answered my prayers! When Cara launched her latest eBook, Grain Free Meal Plans, Freezer Cooking Guide, I might have done a dance of joy! Knowing how awesome Cara’s other books are, I was sure that this one would not disappoint. And it didn’t. This freezer cooking guide is really unique. There are no other resources like it. Rather than requiring one long 10-12 hour cooking day, there are 5 sections that take 2-3 hours each so bulk cooking can be spread out over a weekend, a week of nap times, evenings, or however fits in your schedule. I know that this is something so many NPN readers can benefit from! There are 22 breakfasts, 10 lunches, 16 dinners, 28 snacks and sides, and 8 desserts. Each recipe serves 4 people. All of the recipes are GAPS friendly, which means that they are gluten and grain free. There are also dairy free options for all meals. Small kitchen friendly! Cara has cooked in a small apartment kitchen before and takes space limitations into account with these instructions. Clean up tips! Tips to save/reuse dishes are scattered throughout the book. Print-out re-heating instructions easily attach to your frozen meals to remind anyone how to reheat the meal. Serving instructions and side dish suggestions are printed on the heating instructions. Index of recipes and shopping lists are included. When I asked Cara if I could review this eBook, I told her that I wanted to actually do a run through of all the cooking blocks so I can share with all of you, exactly how this works in real life! I spent a week or so getting myself organized, reading the eBook, and putting plans in place so I could focus on each block. And then, I did it! I am also now in love. The cooking block idea is by far the most brilliant concept ever! Not only was I able to knock out each block in under three hours but I felt more accomplished than I have in a long time. The directions in the book were very easy to follow, I was able to utilize all of Cara’s shortcuts, clean up was a breeze, and storage was no big deal. My kitchen smelled great and I knew that I had some fabulous meals to easily pull together for the next month. I am experienced in the kitchen. Someone who has never roasted a whole chicken and pulled the meat off the bones might spend more time with this task. It took me about 7 minutes to pick the chicken clean. It might take a newbie 20-30 minutes. The same goes for tasks like drying nuts, making condiments, and caramelizing onions. If these sorts of basic cooking techniques are new to you, then they will take more time initially. However, I personally feel that Cara does a magnificent job guiding the cook through each process no matter what your experience level is. The more you use these plans, the quicker everything will take to pull together. I can honestly see myself managing each block in under two hours after becoming more familiar with each recipe. Previous attempts at freezer cooking have led me down the path of putting a few meals together but not being particularly impressed with the taste/texture after thawing and reheating. While I have not reheated every single meal I made from this guide, we have had about a dozen as of writing this post and so far, everything is delicious and stayed intact! I did not end up with mush. Nothing was watery. The flavors were terrific (in fact some of the dishes probably tasted better after having time to “age”) and everything reheated perfectly. If you have been looking for an easier way to prepare nourishing, flavorful, simple, and filling meals for your family, then this time saving resource is a must have! I highly encourage anyone who dabbles in batch and freezer cooking to take advantage of Cara’s methodology. You might just fall in love with cooking again! 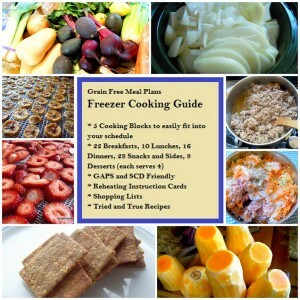 You can purchase your electronic copy of Grain Free Meal Plans, Freezer Cooking Guide for $18.00. For your own chance to win a copy of Grain Free Meal Plans, Freezer Cooking Guide enter by leaving a comment and using our Rafflecopter system below. Two winners will receive one copy via email. Contest is open WORLDWIDE. MANDATORY ENTRY: Visit the Freezer Cooking Guide Table of Contents and tell us what recipes interest you most! You must enter your name and email address in the Rafflecopter entry system for your entry to count, after leaving a comment on this blog post. Contest closes 12.8.2012 at 11:59 p.m. Eastern Time. I would love to try the Taco salad! The whole dehydrating and condiments section looks good. I’m most interested in making the Chicken Pepper Poppers, Crispy Nuts, and the Taco Salad. I’d be interested in the Squash fries, Butternut Squash soup & chicken pepper poppers. Oh my! So many look good, hard to choose. I’d say the chicken pepper poppers. It’s a toss up between the nutbutter brownies and the sesame seed crackers! They both sound good!